Everybody starts from small venture and overtime it may become a true niche business. That is exactly what happened with so many my friends and best buddies. When site growth, user growth, traffic increases, it becomes challenging for us to maintain and sustain quality of the site. That’s where OnCrawl comes into the picture. It crawls your business niche site every month and performs all kind of HTML and SEO checks for you in the background. Why to pay for $500, $1000 or more for SEO service fee? Do it by yourself with smart analyzer. We tried on Crunchify and reports are very detailed. Crunchify is WordPress site and we do use number of different plugins which affects user and site behaviors. In this tutorial we will go over how OnCrawl will help you grow your business and help avoid potential issues on your site. We ran report today on April 8th, 2016 with below settings. It may take up-to an hour to crawl your site based on settings and how big is your site. 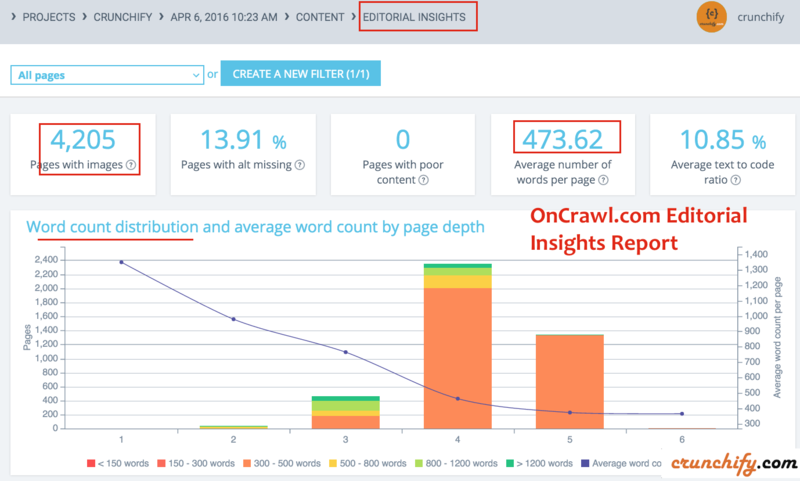 Once your site crawl finishes, you will get an email with report link. Find out detailed analysis on total/average number of InLinks and OutLinks. And possibilities are endless. Each and every tab and reports are very detailed. Why should I use OnCrawl? I believe, your goal should be to provide better and quality rich articles to readers. As you know, overtime broken links, 404 errors, worst page load time, 5xx errors, etc creates bad impression on your users. It’s always good practice to take a look look for a generated report every month and fix most common errors. OnCrawl service charges $12.42/month if you pay annually at signup. Also, OnCrawl has 30 days money free guarantee to try it out. I would say, it’s worth trying and checkout result by yourself. If you don’t like, just cancel your subscription. Use code CRUNCHIFY during signup for 1 month free PRO subscription. At Crunchify, what we are going to fix by looking at report? Verify one more time – noindex on sub pages, i.e. /pages/2/, pages/3/, etc. Fix 6 pages with duplicate meta description, I may start using except now. Verify nofollow link attributes across site. This is where I'm going to spend more time. Found total 11 301 redirects. Need to verify those are correct. So, this is my TODO list and I’m going to fix HTML quality of my site Crunchify. Check it out what you could do with the report and how fix these those Search Engine Optimization related tasks. Get in touch with us if you do have a product, plugins, themes, etc which you think you want to promote on Crunchify.